Richard Goldsmith snr was born into generations of landholders, taverners and farmers at Chalk, Kent, UK, and recorded as a licensed victualler of Rotherhithe, London at his death in 1839. 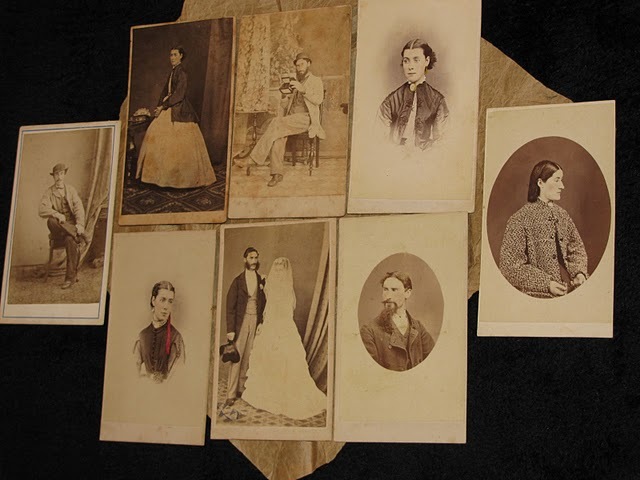 He was the father of Captain Edward Goldsmith (1804-1869) who was the paternal uncle of Elizabeth Rachel Nevin nee Day (1847-1914), wife of Tasmanian photographer Thomas J. Nevin (1842-1923). The name “Richard” persisted through the generations; an older brother of Edward’s was baptised as Richard in 1793 at Chalk and presumed dead when his father devised the will of 1836, but in 1839, having discovered this son Richard was still alive, drew up a codicil to bequeath him a small sum. 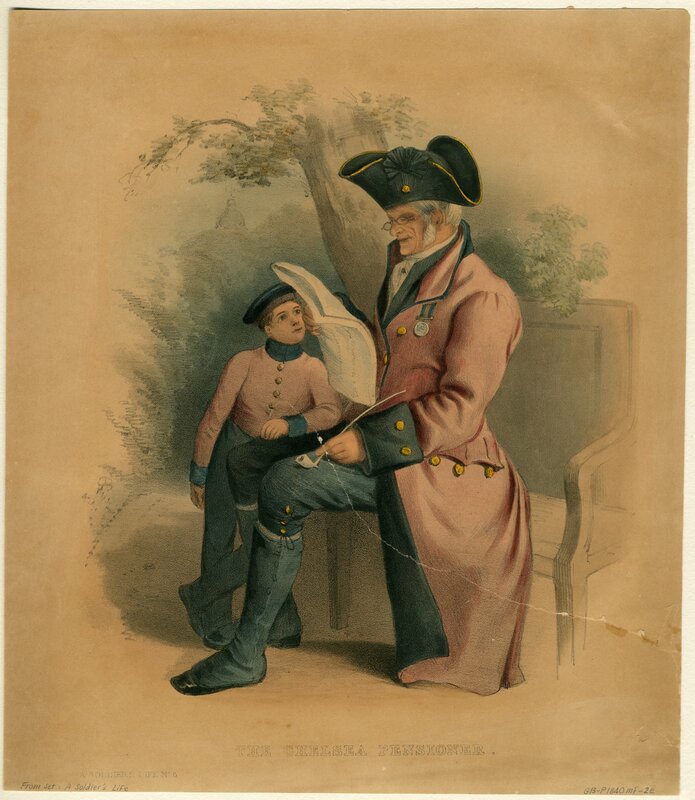 Captain Edward Goldsmith named his first son Richard, born to his wife Elizabeth Goldsmith nee Day at the Swan River, Western Australia, 19th May 1830, days after his arrival in command of the James. On returning to England in command of the Norvalfrom Sydney, their first-born son Richard was christened at St Mary Rotherhithe on 19th November 1830, per record below. 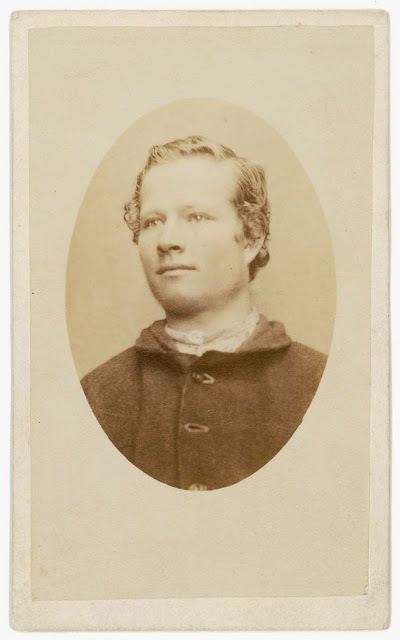 Richard died of fever at Hobart, Tasmania, 15th August, 1854, just 24 years old, during the family’s prolonged stay ashore that year in the colony. 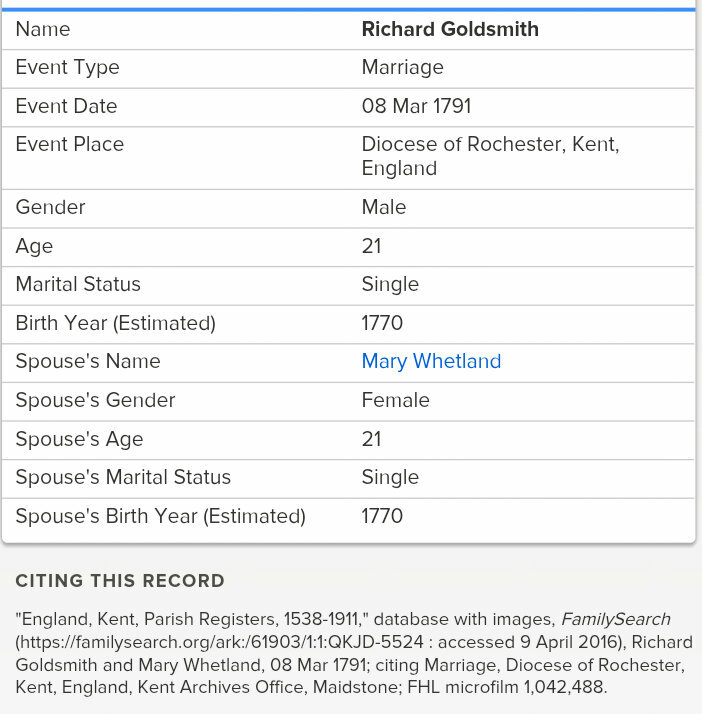 “England Births and Christenings, 1538-1975,” database, FamilySearch (https://familysearch.org/ark:/61903/1:1:JWWW-BP2 : accessed 16 May 2016), Richard Sidney Goldsmith, 11 Nov 1830; citing , reference ; FHL microfilm 254,548, 254,549. Richard Goldsmith snr was buried on 21st March 1839 at St Mary Rotherhithe, Borough Southwark, London. (C of E Deaths and Burials 1813-1900). 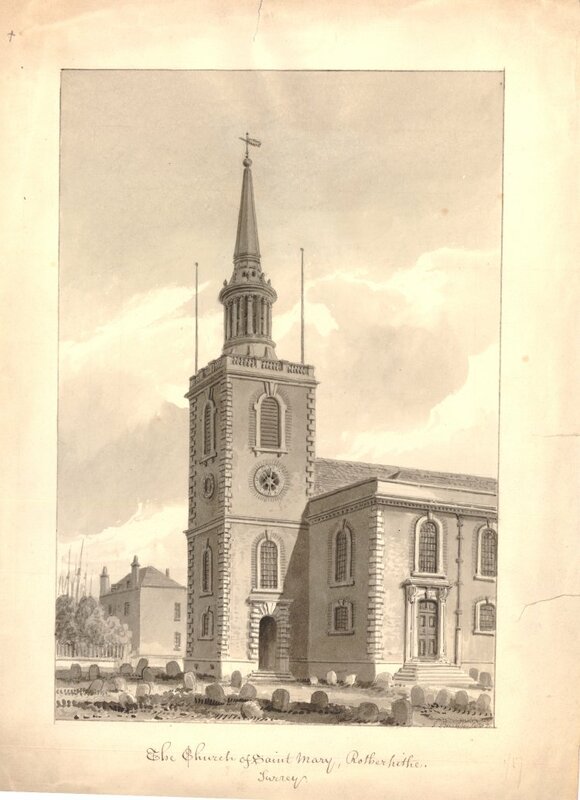 His son Captain Edward Goldsmith managed to arrive back in London in command of the Wave from Hobart, Van Diemen’s Land (Tasmania) in time to see his father alive, to sign the codicil on his father’s will dated 1839 and attend his father’s funeral at St Mary Rotherhithe. 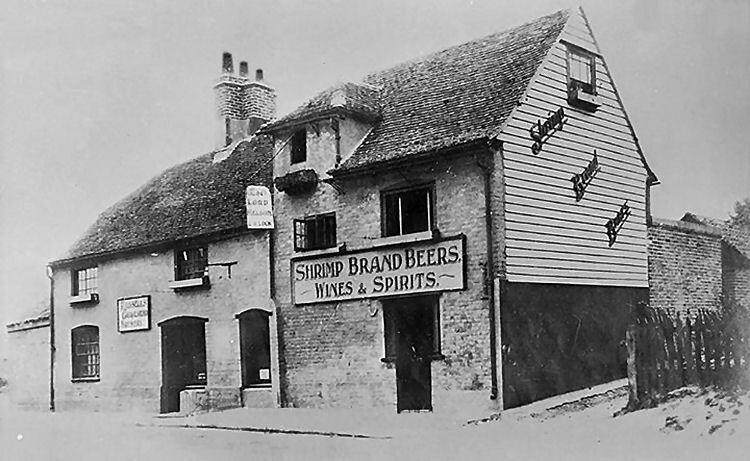 The Lord Nelson, Chalk St, Lower Higham, circa 1910. 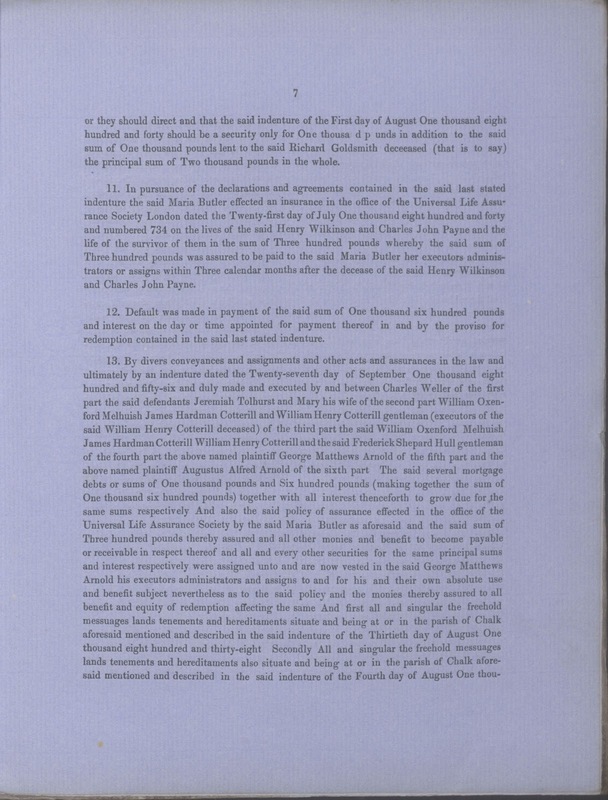 The two brothers, Richard and Joseph Goldsmith held indentures on cottages, houses, gardens, orchards and a public house at Chalk dating back to 1817, recited here by solicitor George Matthews Arnold in his Bill of Complaint filed in Chancery in 1856 against Richard’s will and heirs. 2. By indentures of lease and release date respectively the Nineteenth and Twentieth days of June One thousand eight hundred and seventeen the release being duly made and executed by and between the said Richard Goldsmith of the first part Joseph Goldsmith of the second part Thomas Smith of the third part and George Henry Malme of the fourth part for the considerations therein mentioned All that messuage or dwellinghouse with the garden and orchard belonging to or occupied with the same situate at or near Chalk in the county of Kent and in the occupation of Charles Louch his undertenants or assigns. And also all those Eleven cottages or tenements with the yards and gardens to the same and also a blacksmith’s shop situate at or neat Chalk aforesaid And all those Four cottages or tenements situate at or near Chalk aforesaid And all that barn and an orchard or piece of and containing One acre three roods and thirty-three perches were the same more or less respectively situate at or near Chalk aforesaid and in the occupation of Mr Louch his undertenants or assigns And also all that messuage or tenement uses as a butcher’s shop situate at or near Chalk aforesaid and in the occupation of Thomas Brown his undertenants or assigns which heretofore formed the east end of the messuage And all that stable erected by the said Richard Goldsmith on part of the yard or ground formerly belonging to or occupied with the publichouse formerly known by the sign of the Ship were conveyed unto and to the use of the said George Henry Malme his heirs and assigns subject nevertheless to a proviso or agreement therein contained for redemption of the same premises upon payment by the said Richard Goldsmith his heirs executors administrators or assigns unto the said George Henry Malme his executors administrators or assigns the sum of Five hundred pounds and interest thereon on or at the day or time therein mentioned and appointed for payment thereof. Ten children in all were named by Richard Goldsmith snr in his will of 1839. Captain Edward Goldsmith was one of six children born to Richard and Mary Goldsmith nee Whetland at Chalk, Kent between 1791 and 1804. 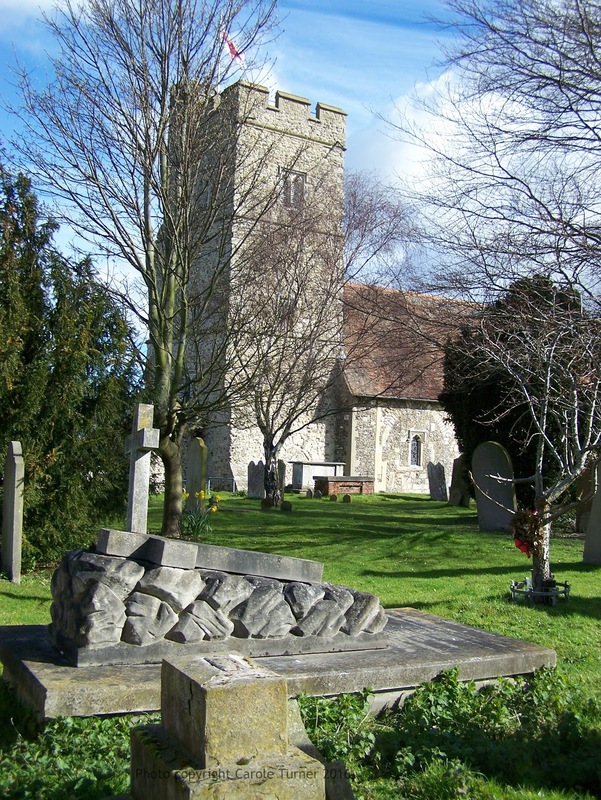 Although Edward appears not to have been christened at St Mary Chalk Church where five of his siblings and generations before him were christened, married and buried, he was interred there in 1869 after a life time at sea in command of merchant ships trading between Europe, the Americas, South Africa and the Australian colonies. Registration of marriage: Richard Goldsmith to Mary Whetland at Chalk Church, 9th March 1791. The first five children of this marriage between Richard Goldsmith snr and Mary Whetland were christened at St Mary Chalk Church, Kent; it appears that Edward may have been christened at St. Botolph Northfleet, Gravesend. Edward Goldsmith christened 1804 at St. Botolph Northfleet, Gravesend, Kent. There were four more children born to Richard Goldsmith, possibly from a second marriage, who were listed as beneficiaries to his will, viz. Alfred, Ann, Emma and Mary, and listed again as beneficiaries in the Bill of Complaint of 1856, Arnold v. Goldsmith (see transcript below). 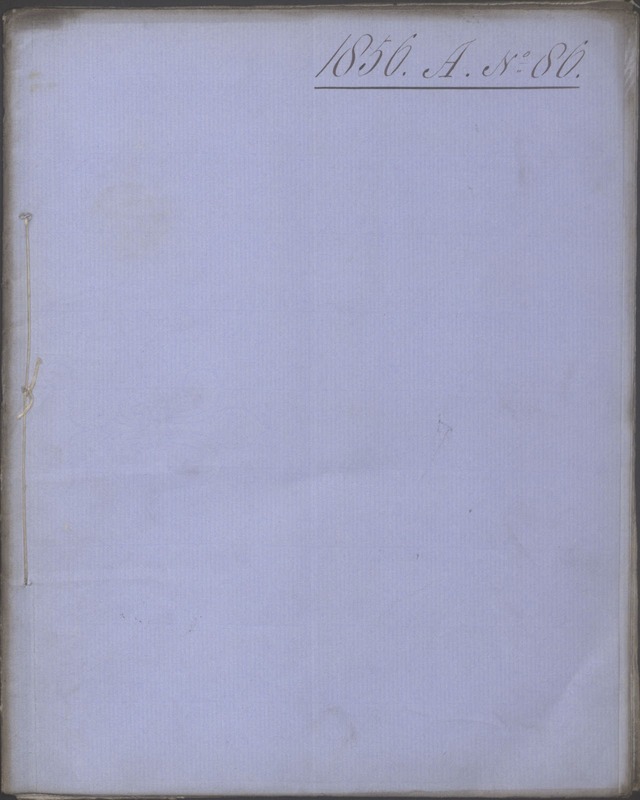 This short account of the life of Captain Edward Goldsmith’s father, Richard Goldsmith snr (1769- 1839) examines his life and the hopes he held for his family in his Last Will and Testament of 1839 at his death. 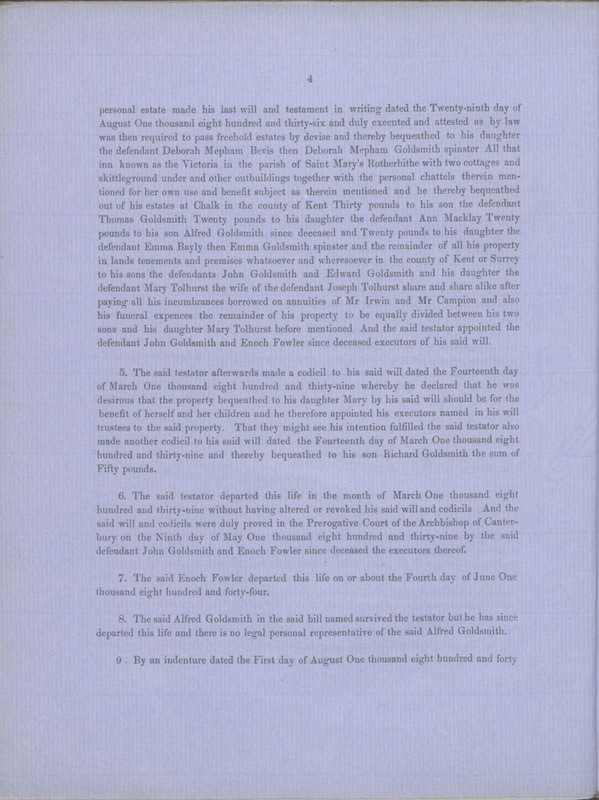 The original will of Richard Goldsmith (1769-1839) of Saint Mary Rotherhithe, Surrey is held at the National Archives, Kew, UK. 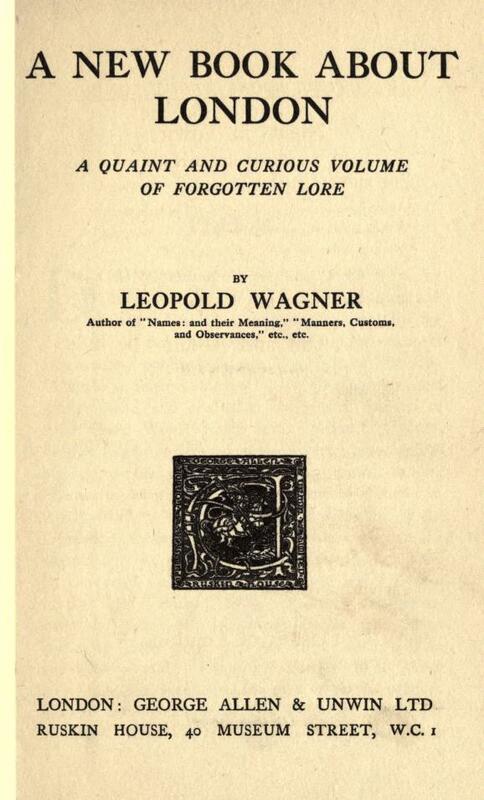 The original will – available here – was written in italic, and in parts is indecipherable or illegible. As a result, the piecemeal transcript below may only give a general idea of Richard Goldsmith’s intent. Mary Mepham – cousin of Deborah, niece of Richard snr? By the Grace of God Amen I Richard Goldsmith of the Victoria Inn or Victualling House late the Ship on Launch in the parish of St. Mary’s Rotherhithe in the County of Surry being of sound mind and understanding and having the Love and Fear of God before me do make this last will and testament that is to say that in consideration of my standing indebted to my daughter Deborah Meopham Goldsmith in the sum of one hundred pounds of lawful British money bequeathed to her by her late cousin Mary Mepham of the parish of Milton next Gravesend in the county of Kent do will and bequeath to her my daughter Deborah Meopham Goldsmith all that Inn known by the Victoria in the parish of St. Mary’s Rotherhithe with two cottages and skittle ground under and other outbuildings together with my household goods stock in trade plate linen and trinkets to her for her own use & benefit but subject to the paying of my just debts owing at the time of my decease to all my spirit and wine merchants and my porter and ale brewers, and allso the money borrowed of Messrs ? and Company to build the public house walls at known by the name of the Victoria in the parish of St Mary’s Rotherhithe in the County of Surry amounting together with the purchasing the freehold of Sir ? Moris? to 1800 with 5 pr cent pr annum interest for the money so borrowed. I allso will and bequeath out of my other estate at Chalk in the County of Kent 30 pounds to my son Thomas Goldsmith 20 pounds to my daughter Ann Macklay 20 pounds to my son Alfred and 20 pounds to my daughter Emma and the remainder of all my property in lands tenements and p? whatsover and whosoever in the County of Kent or Surry to my son John now living in the Borough Road in the county of Surry whip maker??? to Captain Edward Goldsmith mariner and Mary Tolhurst wife of Jeremiah Tolhurst of Milton next Gravesend in the county of Kent ? ? they share and share alike after paying all my encumbrances borrowed on annuities of Mr ?? Campion and also my funeral expenses which I darest be so plain or plain with Elm coffin covered with cloth but brown with common black nails and bourn to the parish church or burial ground by men with six of my friends and acquaintances whom they shall see fit to be pall bearers The remainder of my property to be equally divided amongst my two sons and my daughter Mary Tolhurst before ? and if they cannot agree amongst themselves let it be sold and the prod? shared that before named but the prod? or sum so divided which may be ? to my daughter Mary Tolhurst for her own use and that of her children I desire that my request be complied with that Mr Jeremiah Tolhurst may have no control over one shilling of her money left by me to her but ? her and her children by my executors. I particularly request of my daughter Deborah to take great care of Caroline [inserted ” as afar as circumstances will allow”] Tolhurst and particularly request my sons John & Edward to see my request complied with. 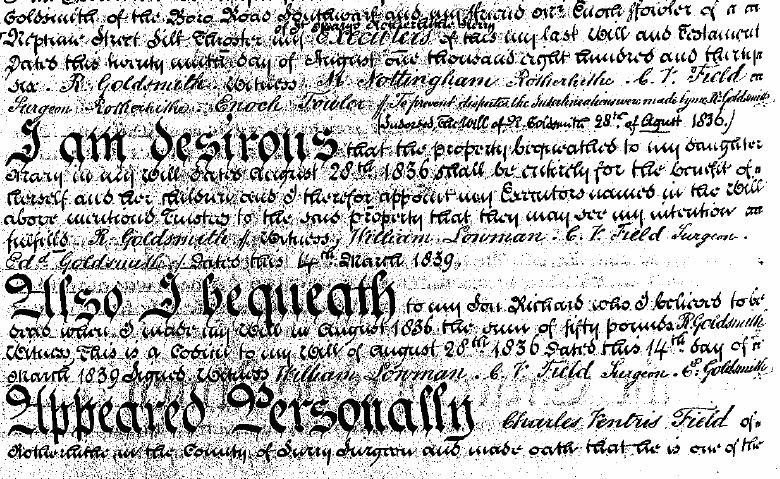 I also appoint my son John Goldsmith of the Borough Road Southwark and my friend Mr Enoch Fowler of Neptune Street silk thrower of St Mary Rotherhithe ?my executors of my last will and testament dated this twenty-ninth day of August one thousand eight hundred and thirty six. R, Goldsmith witness M. Nottingham Rotherhithe . C. V. Field Surgeon Rotherhithe Enoch Fowler 28th August 1836. To prevent disputes the interlineations were made by me R. Goldsmith. Endorsed the will of R. Goldsmith 28th August 1836. I am desirous that the property bequeathed to my daughter Mary in my will dated August 28th 1836 shall be entirely for the benefit of herself and her children and I therefore appoint my Executors named in the Will above mentioned Trustees to the said property that they may see my intention fulfilled. R. Goldsmith // Witnesses, William Lowman. C. V. Field, Surgeon. Ed’d Goldsmith. Dated 14th March 1839. Also I bequeath to my son Richard who I believed to be dead when I made my will of August 28th 1836 the sum of fifty pounds. R. Goldsmith. Witness. This is a codicil to my will of August 28th 1836 dated this 14th day of March 1839. Signed witness William Lowman. C. V. Field, Surgeon. E. Goldsmith. Appeared personally. Charles Ventris Field of Rotherhithe in the County of Surry Surgeon and made oath that he is one of the attesting witnesses to the last will and Testament bearing the date the twenty-eighth day of August one thousand eight hundred and thirty six and also to the codicils thereto bearing the date respectively the fourteenth day of March one thousand eight hundred and thirty-nine of Richard Goldsmith late of Victoria Inn in the parish of Saint Mary Rotherhithe aforesaid Licensed Victualler ? now here unto ? and having observed the following interlocutions?interlineations? in the said will to wit the words and ? porter? ? ? to be underlined ? / ? and ? ? from the top of the first side there of the words “the County of Kent” to be ? between the first and second lines of the ? ? ? side ? of the words “share and share alike” to be underlined ? the ? and ? lines from the top of the same side the words to be Pall Bearers ” to be underlined between the sixteenth and seventeenth lines from the top of the same side the word “divided” to be underlined between the said seventeenth and eighteenth lines of the same side the name “Jeremiah Tolhurst” to be underlined between the twenty third and twenty fourth lines from the top of the same side the words and name “To prevent disputes the inter? were made by me R. Goldsmith”. to be written and signed at the bottom of the said third side the name of “Tolhurst” to be underlined between the third and fourth lines from the top of the fourth side thereof “as ar as ? will allow her” to be underlined between the the said fourth and fifth line line of the same side the words “Mary’s Rotherhithe Surry” to be underlined between the tenth and eleven lines of the same side this ? said that the said several interlineations were made by the said deceased previous to the execution of this said will and that this said will and that this said will is now in the same plight and condition as when executed by the deceased on the twenty ninth of August one thousand eight hundred and thirty six the day of the date thereof in the presence of ? and ? of Rottingham ? and Enoch Fowler the other subscriber witnesses thereto and the ? made oath that on the said fourteenth day of March one thousand eight hundred and thirty nine being the day of the death of the said testator ? the said Testator who was at such time ill in ? ? executed his said codicils to his said will the first of the said codicils beginning thus “I am ? desirous that the property bequeathed to my daughter Mary in my will “? this ” that they may see my intentions fulfilled” and this subscribed and dated “R. Goldsmith dated this 14th March 1839” The said codicil containing as follows “Also I bequeath to my son Richard who I believed to be dead when I made my will in August 1836 the sum of fifty pounds” and this subscribed “R. Goldsmith” with the following words and date thereto. Witness this is a codicil to my will of August 28th 1836 dated this 14th day of March 1839 ?? signing his name thereto in ? as now appears in the presence of this Deponent and of William Lowman and Edward Goldsmith the other subscribed witnesses thereto who were then together present at the same time with the said deceased and this Deponent and the said William Lowman and Edward Goldsmith attested and subscribed to the said codicils in the presence of the said Testator and of each other and this Deponent referring to the ? of the date of the will of the deceased in the said codicils oat August 28th 1836 said that the said will was executed by the said deceased on the twenty ninth day of August one thousand eight hundred and thirty six but that the said deceased after sealing the same up through Error endorsed the same 28th August 1836 in the manner as now appears and that the writer of said codicil copied the date of the said will from such endorsement in the presence of this Deponent ? the said will will being then so sealed up instead of the twenty ninth day of August one thousand eight hundred and thirty six to the date thereof. C. V. Field on the thirtieth day of April 1839 the said Charles Ventris Field was duly sworn to the truth of this affadavit before – John Danbeny of Surry, Pres John I Mandell, Not. Pub. Proved at .. Proved at London with two codicils 9th May 1839 before the worshipful John Danbury Doctor of Laws & Surrogate by the oaths of John Goldsmith the son and Enoch Fowler the Executor to whom admin was granted having been sworn duly to admin. His concern extended to a daughter of that marriage, his granddaughter Caroline Tolhurst. Richard Goldsmith was unequivocal in wishing to trust the future of his daughter Mary Tolhurst and her daughter Caroline to his sons John and Edward Goldsmith and their sister Deborah to see that “Jeremiah Tolhurst may have no control over one shilling of her money left by me to her“. Richard Goldsmith was the listed licensee of the China Hall public house and tenements at 1-4 China Hall Place, Lower Deptford-road, Rotherhithe, London from 1822 (Petty Sessions). 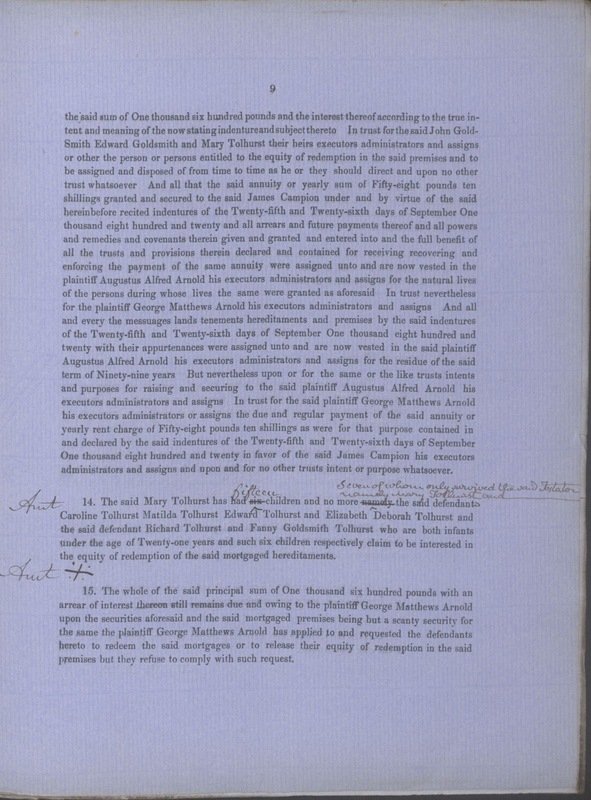 The mortgages, indentures and income on the tavern, tea gardens and tenaments at China Hall Place were the subject of a Bill of Complaint in 1856 which plaintiff George Matthews Arnold filed against Richard Goldsmith’s will of 1839 and its beneficiaries, the much enlarged Goldsmith family, and specifically against the two sons of Richard Goldsmith snr – John Goldsmith and his younger brother Captain Edward Goldsmith. 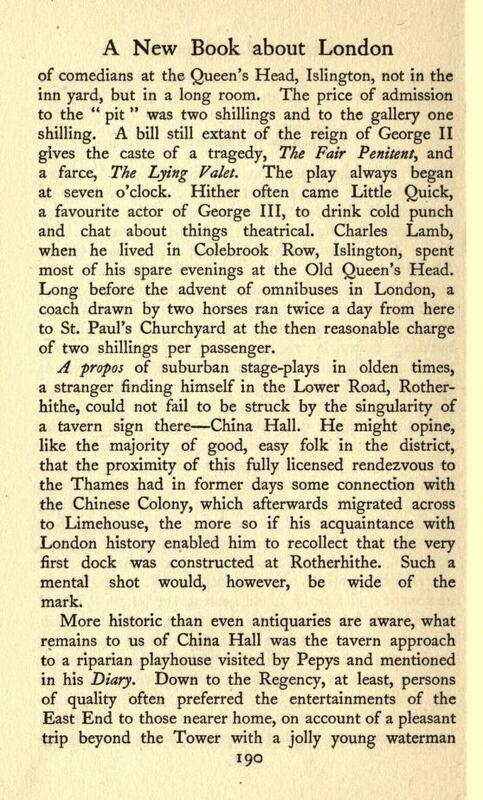 Description: The ‘China Hall’, Lower Road, Southwark On Lower Road opposite the park. By 1826 Richard Goldsmith was also registered as proprietor and licensee of the Ship on Launch at No. 9 Lower Deptford Road, Rotherhithe. 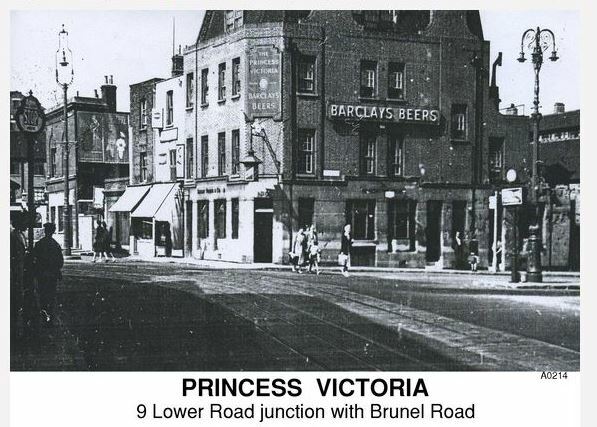 The name Ship on Launch was changed to the Princess Victoria Inn in 1836 when construction began on the Brunel Tunnel – as a foot tunnel – diagonally opposite Richard Goldsmith’s premises. 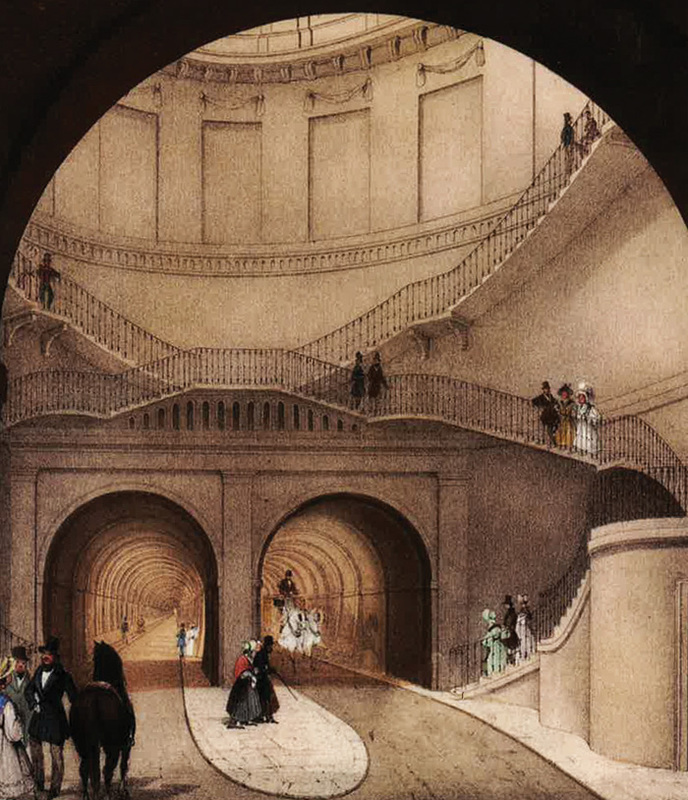 By the time of completion of the tunnel in 1845, the Goldsmiths would have enjoyed a decade of exceptional profit from passing traffic. A substantial building of four storeys, the Princess Victoria Inn, known locally as The Vic, closed its doors for the last time in 1983. On her father’s death in 1839, Deborah Meopham Goldsmith inherited the Princess Victoria Inn, 9 Lower Road, Rotherhithe, (SE16 in Pigot’s Directory). In the 1841 UK Census she was listed as resident of Paradise Row, which is now Union Road Bermondsey, its name changed in 1912. In 1842 she was listed as D. M. Goldsmith, licensee (Petty Sessions). Enoch Fowler, Richard Goldsmith’s executor, had filed for bankruptcy in 1827. He was a silk-man and silk-thrower who originally resided at China Hall Place. Around the time of the fire which destroyed his house at China Hall and the adjoining silk mill, Richard Goldsmith acquired the license to the China Hall tavern and houses numbered 1-4 China Hall Place, now known as China Place Mews. 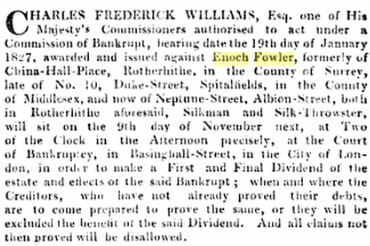 Enoch Fowler was declared bankrupt on 19th January 1827, and died in 1844. Mrs. Mason was a patient in the 72nd year of her age, who was tapped by the plaintiff for ovarian dropsy, and died soon afterwards, the colon having been punctured by the trocar. Mrs Jane Smith deposed to having delivered by Mr. Field, in 1826, when she felt as if she was being torn to pieces…. Richard Goldsmith snr died within weeks of seeing the codicils to his will attested to by his sons Captain Edward Goldsmith and John Goldsmith. He was buried on 21st March 1839 at St Mary Rotherhithe (the Mayflower Church) Borough Southwark, London. Richard Goldsmith snr was the son of Abraham and Mary Goldsmith of Chalk, Kent. He was baptised on 27th August 1769 at Chalk Church, Kent. Richard Goldsmith’s first wife was Mary Whetland, daughter of Willim [William] and Debere [Deborah] Witland [Whetland]. She was christened on 17th January 1768 at Chalk Church. They married on 8th March 1791 in the Diocese of Rochester, Kent. These five siblings of Captain Edward Goldsmith were born at Chalk, Kent and baptised at St Mary’s Chalk Church, Kent between 1791 and 1799 to parents Richard Goldsmith and Mary Goldsmith nee Wetland who married at Chalk Church 8th March 1791. Thomas Goldsmith, baptised 21st July 1793, son of Richard and Mary Goldsmith nee Whetland (Medway Archives & Local Studies Centre Ref: P77/1/2) Richard and Thomas may have been twins. Richard and Mary Goldsmith nee Whetland bapstised their first five children at St Mary Chalk Church between 1791 and 1799. Edward’s birth place and year of birth appear as Chalk, 1804 on his master mariner registration at Trinity House in 1829. So, while he was born at Chalk, he may have been baptised at St. Bitolph’s, Northfleet, not far from Rotherhithe, or possibly even at St. Mary’s Rotherhithe. This may or may not be his record of baptism. Richard Goldsmith snr may have married a second time to Harriot Parrock in 1805. The name “Parrock” features in the history of the Goldsmiths; Edward Goldsmith sailed the barque, the Parrock Hall in 1838 to Mauritius, Colombo, Rio, the Cape and China, (source: The Asiatic Journal 1838) and in 1844 as commander of the Parrock Hall on the London-Sydney, NSW wool trade route. George Mathews Arnold, solicitor to the executors of Captain Edward Goldsmith’s will, lived at Parrock St. Gravesend and built a mansion there in 1874. If there was a second marriage of Richard Goldsmith in 1805, his first wife Mary Whetland may have died soon after giving birth to Edward. She would have been 36 years old, in that event. Harriot Parrock may have been the mother of the other four children mentioned in Richard Goldsmith’s will, children born after Edward Goldsmith, viz. Alfred, Ann, Mary and Emma. Richard Goldsmith snr may have served in the Royal Navy on the Aboukir in 1815. If so, he was listed as a carpenter on attestation, wounded in 1815 and granted a life pension. These records coincide with the age and death of Richard Goldsmith snr from Chalk, but little else (National Archives UK). These may not be the correct records. The pension records for pensioner Richard Goldsmith cease in 1839 in the same year as licensed victualler’s Richard Goldsmith’s death, at the Victoria Inn, Rotherhithe. HMS Aboukir was a 74-gun third rate ship of the line of the Royal Navy, launched on 18 November 1807 at Findsbury, placed on harbour service in 1824, and sold in 1838. Piece description Register of candidates for admission to Greenwich Hospital. In the 1770s, a wooden theatre built next to the China Hall warehouse accommodated 500 people. The theatre burned down in 1789, and reopened as a tavern and tea gardens at the turn of the 19th century. Richard Goldsmith was the licensed victualler of the China Hall, and the houses, Nos.1-4 at China Hall Place, No. 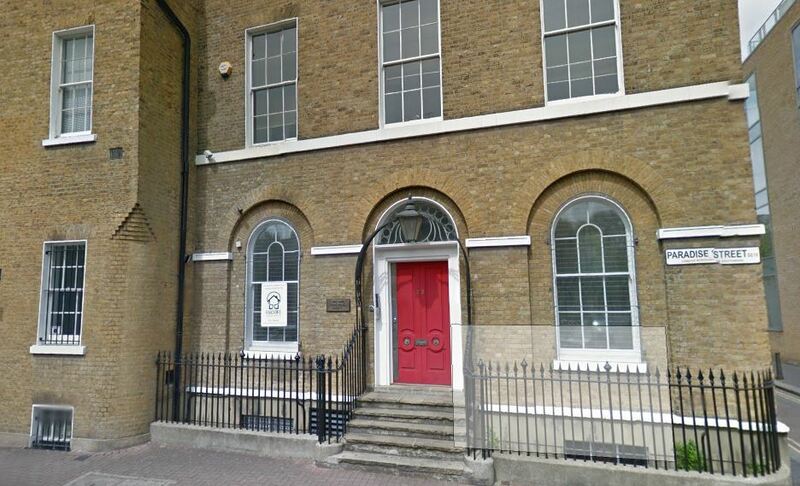 141 Lower Deptford Road, Rotherhithe, from 1822 and from 1826 he was also the proprietor of the Ship on Launch, No. 1-9, Lower Deptford Road, renamed the Princess Victoria Inn in 1825. Known locally as The Vic, it was located diagonally across from the entrance to Brunel’s Thames Tunnel which was completed in 1845. Victorian portrayals of the Grand Entrance Hall to the Tunnel. 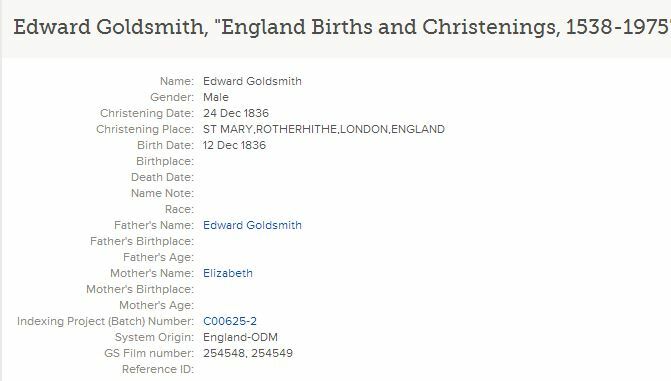 Richard Goldsmith’s grandson and son of Captain Edward Goldsmith, Edward Goldsmith jnr (1836-1881) was christened at St. Mary Rotherhithe on 24th December 1836. 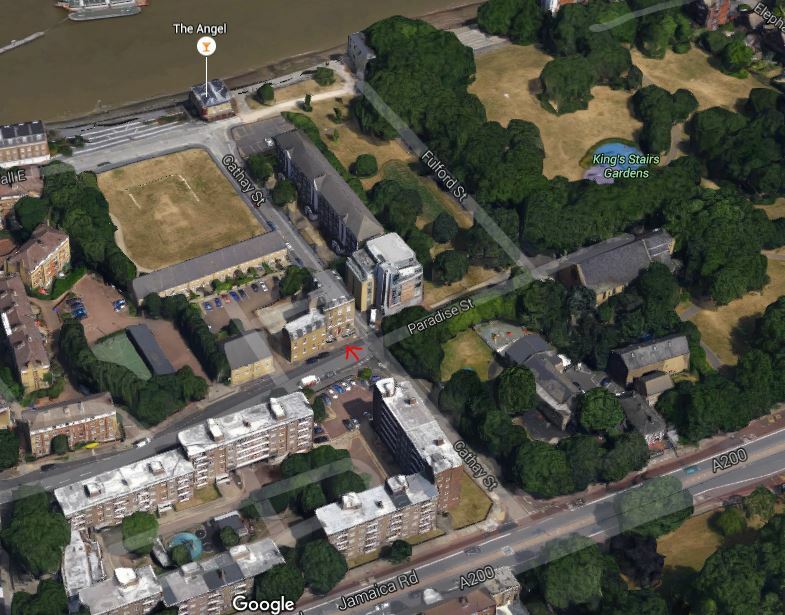 Master mariner Captain Edward Goldsmith (1804-1869) attended the burial of his father Richard Goldsmith (1769-1839) in the churchyard of St. Mary’s Rotherhithe – the Mayflower church -, Burough of Southwark, London on 21st March 1839. He had arrived back in London from a round-trip to Hobart, Van Diemen’s Land (Tasmania) as master of the barque Wave on 12th February 1839 with barely enough time to see his father alive and to execute his father’s request to witness alterations to the will. A month later, on 14th March, 1839, his presence was requested to sign the two codicils to his father’s will in the presence of the two other witnesses, William Hendall Lowman, army officer in the East India Company (Letters to the Secretary of King’s College London KA/IC/L87), and Charles Ventris Field, surgeon and apothecary, whose reputation in previous years was entangled with his partner Sir William Gaitskell’ s alleged body-snatching activities at Paradise Row, Rotherhithe as well as libel actions over deaths from his claims to cure “ovarian dropsy”. 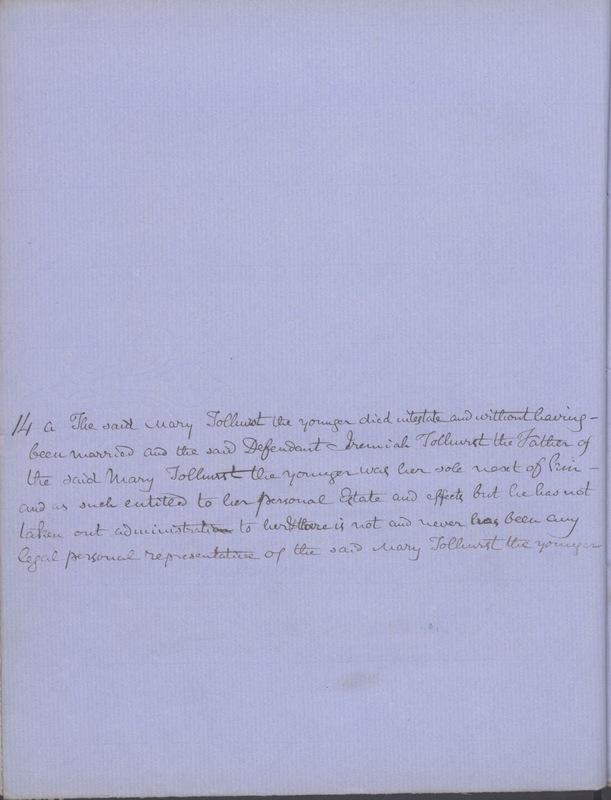 Charles Ventris Field appeared in person on 14th March to validate the revisions and annotations to Richard Goldsmith’s sealed will of 1836 and its codicils in 1839, his written testimony added to the final document [NB: this script is barely legible in places]. 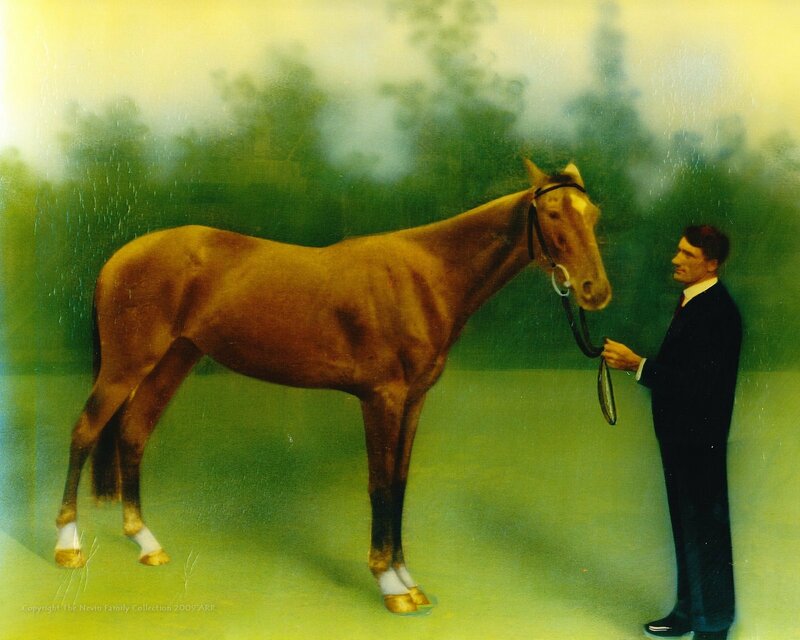 Within days of signing the codicils, Richard Goldsmith snr died. At the time of his death, he was the licensed victualler of the Princess Victoria Inn, Deptford Road (Lower Road) Surrey, Parish of St Mary Rotherhithe, 69 years old and Anglican. 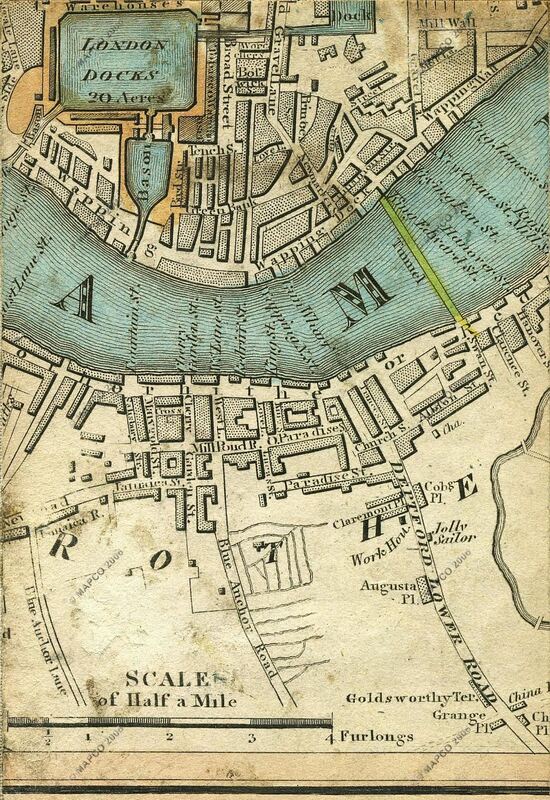 His executors included his son John Goldsmith of 67 Blackman St. Borough, Rotherhithe. View of the church of St Mary Rotherhithe, in London, from the graveyard. Ten days later, on 25th March 1839, Captain Edward Goldsmith penned a letter while still in London which was published in the Colonial Gazette. In that letter he endorsed the opinion of his friend Captain William Langdon, R. N. that the Falkland Islands should become a British colony, a penal colony no less, and being in a direct line between London and Sydney, would provide merchantmen with much needed supplies. E. GOLDSMITH, Master of the barque Wave London, March 25, 1839. Two months later, on May 10th, 1839, Captain Edward Goldsmith departed London as master of the barque Wave(400 tons laden), dropping anchor at Berkeley Sound for several weeks on East Falkland Island as was his stated intention – “to call there again on my next voyage“. He arrived in the “stream” at the River Derwent, Hobart, Van Diemen’s Land (Tasmania) on October 1st, 1839, and discharged the London cargo before leaving for Port Phillip, Melbourne, Victoria. On board was his wife, Elizabeth Goldsmith nee Day, several months pregnant. She had bought a cargo of fashionable items in London including bonnets, to supply to the merchants of Hobart Town. Mon 2 Sep 1839 Page 2 HARDY’S LONDON SHIPPING LIST, 26TH APRIL, 1839. 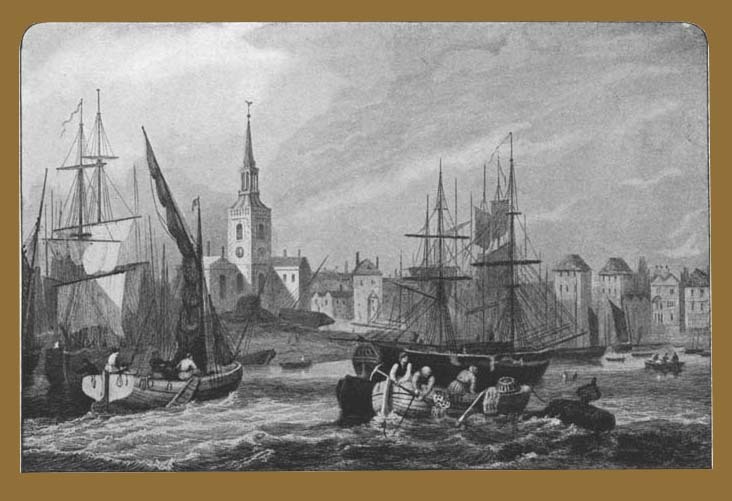 When Captain Edward Goldsmith returned to London in January 1840, he had death duties on his father’s estate to pay, and another death to deal with, that of his new-born son Bentley Goldsmith, named after a close associate of Captain Goldsmith, Robert Bentley, silk and ribbon merchant, whose son William Bell Bentley (b. 1833) also listed as silk merchant in the 1851 UK census, would become the executor of Captain Goldsmith’s own will in 1870. But Bentley Goldsmith survived less than a month. He was born in London on 17th January 1840 and died on 1st February 1840. He was christened on 20th January 1840 at St Mary Rotherhithe where Richard Goldsmith was buried and where Edward Goldsmith jnr and his cousin Elizabeth Rachael Day were also christened. 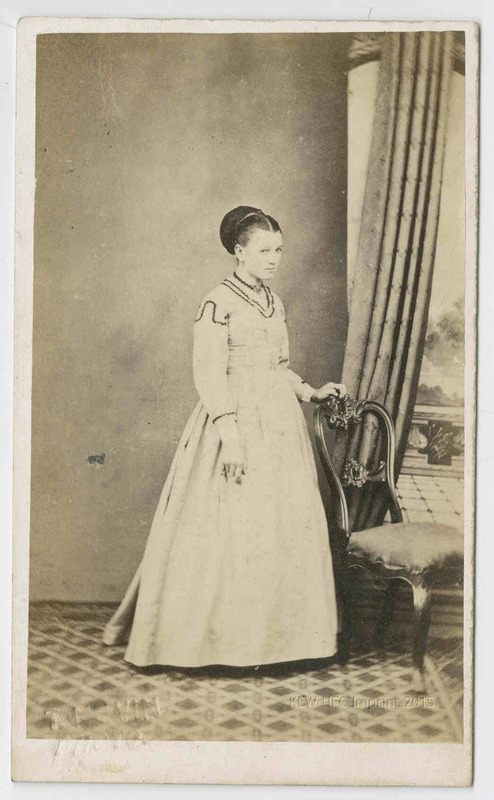 Elizabeth Rachel Day, Edward Goldsmith’s niece, daughter of his wife’s brother Captain James Day, was born and baptised in 1847 at Rotherhithe, and married photographer Thomas J. Nevin at Kangaroo Valley near Hobart, Tasmania in 1871. 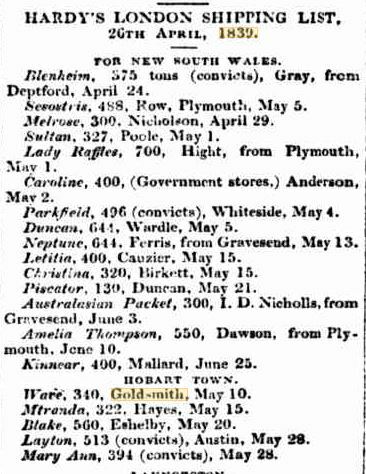 Bentley Goldsmith was most likely conceived in June 1839 about the time Elizabeth Goldsmith departed London for Hobart on board the Wave, her husband Captain Goldsmith in command, arriving Hobart on September 26th, 1839. When Elizabeth Goldsmith arrived back in London four months later, she was heavily pregnant and possibly not in good health, which may account for the birth and death of her new-born son Bentley Goldsmith with weeks of arrival (Jan-Feb 1840), and the absence of Bentley Goldsmith in the 1841 census. It was not the first time she had taken such a risk. Their first son Richard Sydney Goldsmith was born just days after their arrival at Fremantle, Western Australia, after a calamitous journey on board the James (1830). 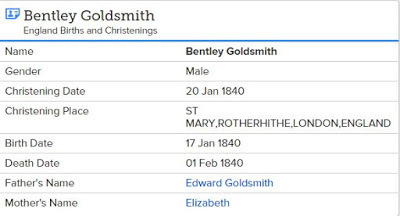 “England Births and Christenings, 1538-1975,” database, FamilySearch (https://familysearch.org/ark:/61903/1:1:JM4K-BMG : accessed 5 April 2016), Bentley Goldsmith, 20 Jan 1840; citing , reference ; FHL microfilm 254,548, 254,549. The UK census of June 1841 listed Captain Edward Goldsmith’s wife Elizabeth and their four year old son as residents of Surrey Place, Rotherhithe with her servant Betsy Parryman, among several other members of the household, but not her husband. Neither was their eleven year old son Richard Sydney Goldsmith (1830-1886) listed at her Surrey address which was a row of houses occupied largely by sea captains’ families, located opposite Surrey Square. She had not accompanied Captain Goldsmith on his next trip to the Australian colonies after the death of their new-born son Bentley the previous year. On the night of the census, 7th June 1841, Captain Goldsmith was six weeks out from London in command of the Wave, once more on the return journey from Hobart (VDL), departing on 14th March, arriving back in London on July 22nd, 1841. Neither of their two older sons, Richard Sydney Goldsmith, (1830-1854) and Edward jnr (1836-1881) would live long enough to see the 20th century. With their father’s estate settled by 1841, Captain Edward Goldsmith and his brother John Goldsmith turned their attention to the future development of their father’s holdings at Chalk, Kent in addition to their own properties in the nearby parish of Higham. When not at sea or ashore at Hobart, Edward’s family home by 1842 was the house and five acres up Telegraph Hill, known as Gad’s Hill House in the village of Higham, Kent where his wife Elizabeth and sons, Richard Sydney and Edward jnr settled, notwithstanding further voyages to and from Sydney and Hobart where they also owned property, notably the house at 19 Davey Street, Hobart, their residence during Captain Goldsmith’s protracted efforts in the early 1850s to establish a patent slip and ship-building yard and see his steam ferry, S.S. Kangaroo finally off the stocks into service on the River Derwent. 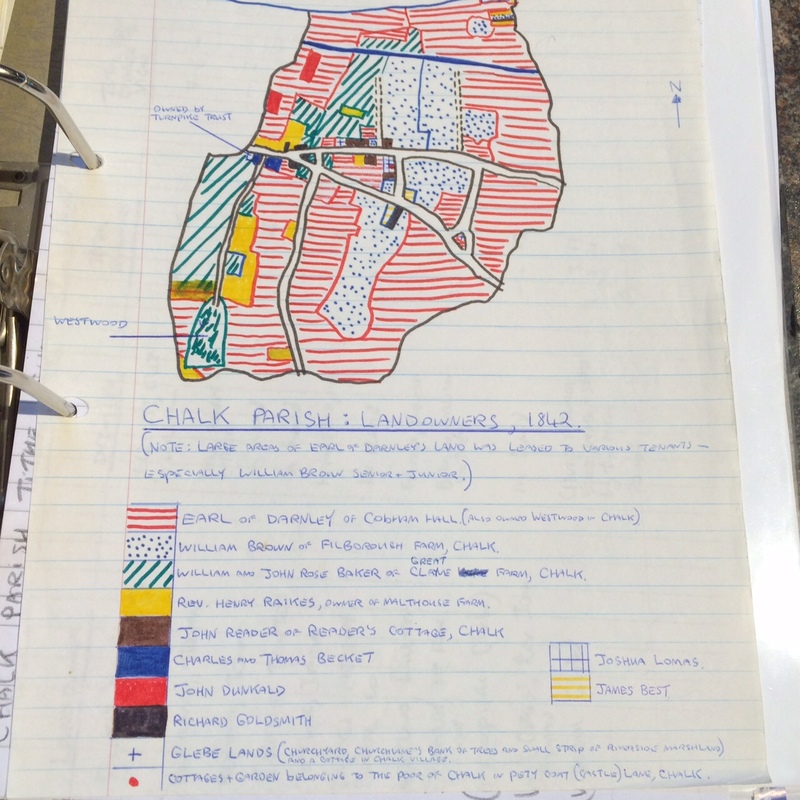 In his father’s will, Richard Goldsmith snr had stipulated management of the Goldsmith properties in the parishes of Higham and Chalk to be maintained by his sons Edward and John. The tithe map of 1842 for Chalk Parish shows those areas marked as Richard Goldsmith’s. The properties in the parish of Higham are not shown. 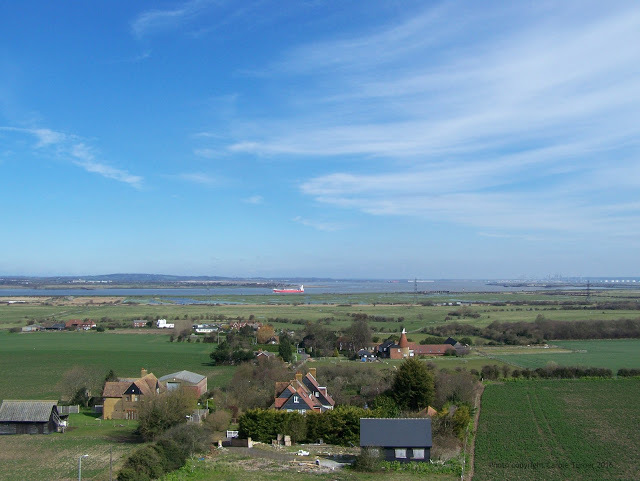 View from the tower of St Mary the Virgin Church, Chalk Kent UK, known as Chalk Church, down Church Lane to Lower Higham Road, the Salt Marshes and the Thames beyond. Deborah Meopham Goldsmith was the older sister of Captain Edward Goldsmith. On the death of their father Richard Goldsmith in 1839, she was the designated licensee of his public house, the Victoria Inn, in Paradise Row, Rotherhithe (London, UK), formerly known as the Ship on Launch. The 1841 Census estimated her age between 30-34 yrs old, which does not tally with her birth and baptism recorded at Chalk Church on 6th January 1799. She was resident in Paradise Row together with five others; a married couple and child (Benjamin and Mary Fordham, with 6 month old child Alfred); William Wood; and Martha Stanbridge. She married Daniel Bevis sometime before 1856. 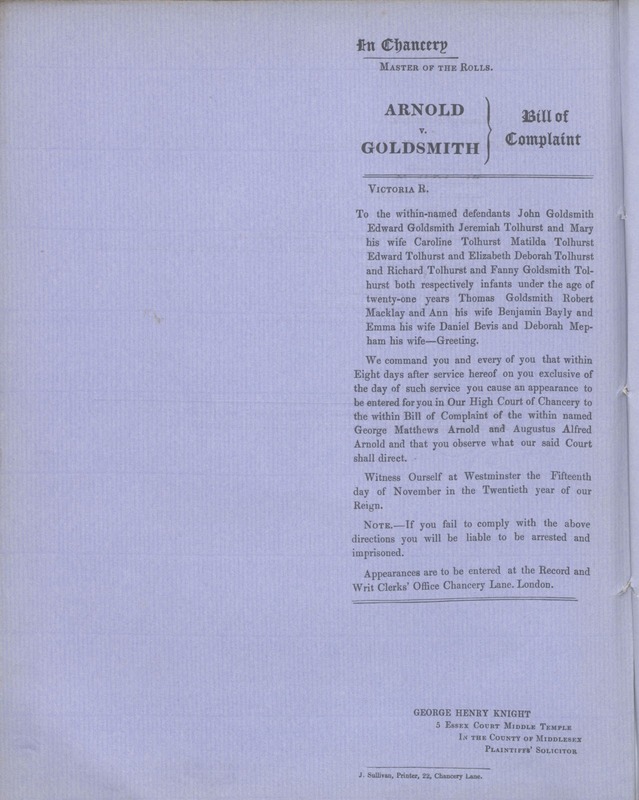 Extraordinary as it may seem, a Bill of Complaint was lodged in Chancery against the will and beneficiaries of the estate of Richard Goldsmith by solicitor George Matthews Arnold less than six months after Captain Edward Goldsmith’s arrival back at his residence, Gad’s Hill House, Telegraph Hill, Higham, Kent. His departure from Hobart, Tasmania – delayed in 1854 in order to complete the colonial government’s patent slip and the launch of his steam ferry the SS Kangaroo – was permanent. 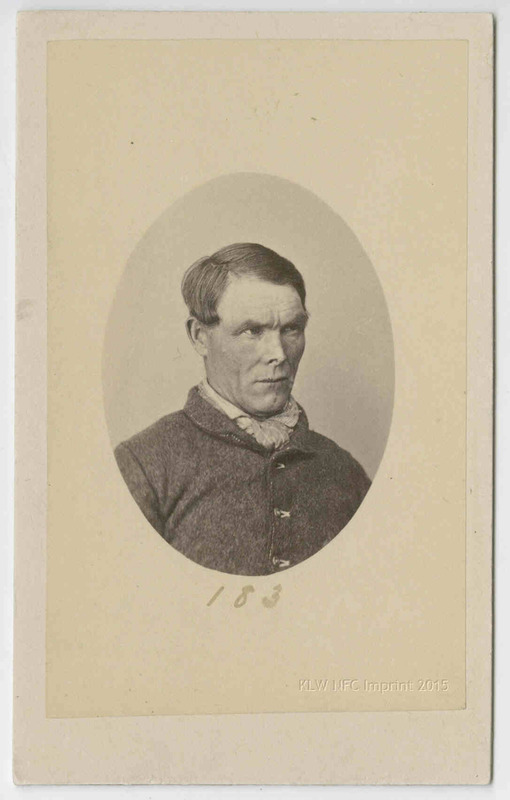 He sailed from Hobart in February 1856 with his wife Elizabeth and their only surviving son Edward Jnr as passengers on board the Indian Queen, never to return to the Antipodes. Short title: Arnold v Goldsmith. Plaintiffs: George Matthews Arnold and another. 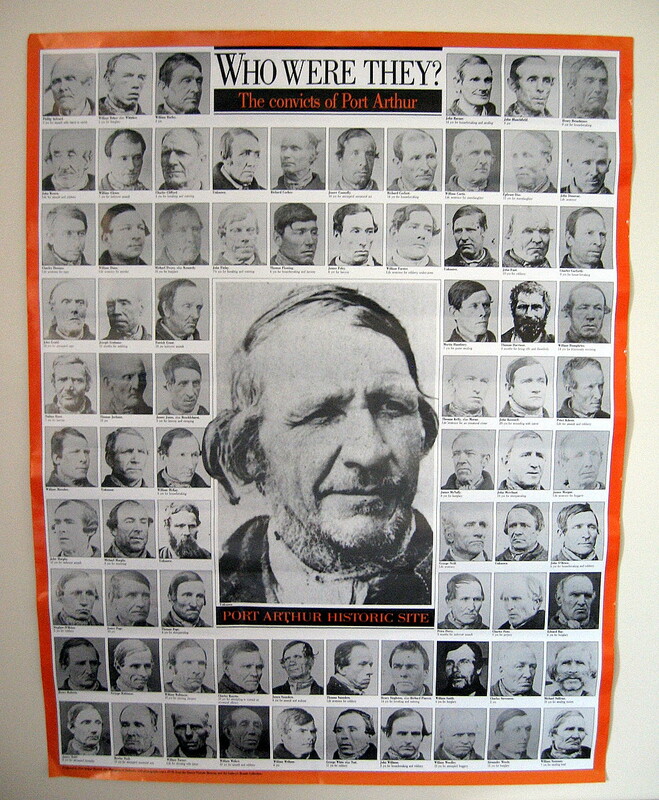 Defendants: John Goldsmith, Edward Goldsmith, Jeremiah Tolhurst, Mary Tolhurst his wife, Caroline Tolhurst, Edward Tolhurst, Elizabeth Deborah Tolhurst, Richard Tolhurst, Fanny Goldsmith Tolhurst infants, Thomas Goldsmith, Robert Macklay, Ann Macklay his wife, Benjamin Bayly, Emma Bayly his wife, Daniel Bevis and Deborah Mepham [Bevis] his wife. DANIEL BEVIS and DEBORAH MEPHAM his wife. 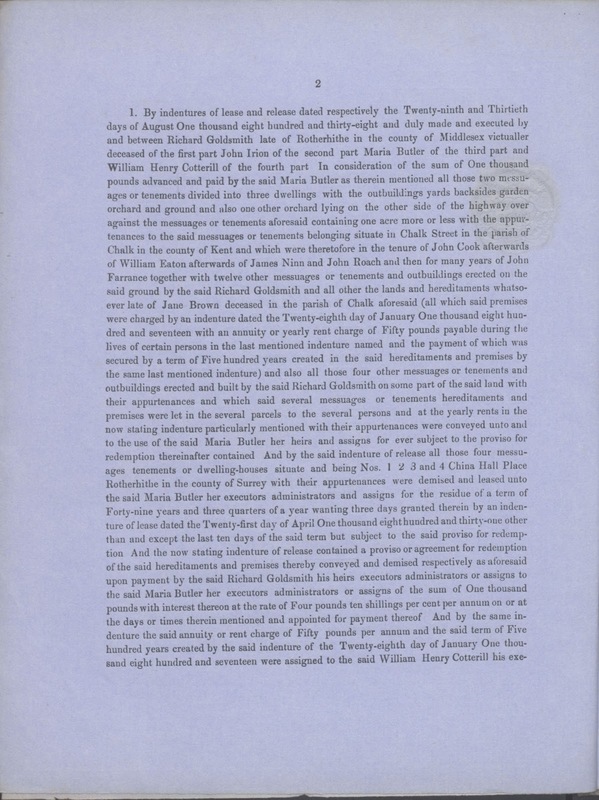 – cutors administrators and assigns in trust in the first place for securing to the said Maria Butler her executors administrators and assigns the payment of the said sum of One thousand pounds and interest and subject thereto in trust for the said Richard Goldsmith his heirs executors administrators and assigns. 3. By indentures of lease and release dated respectively the Twenty-fifth and Twenty-sixth days of September One thousand eight hundred and twenty the release being duly made and executed by and between the said George Henry Malme of the first part the said Richard Goldsmith of the second part James Campion of the third part and John Campion of the fourth part For the considerations therein mentioned all and singular the hereditaments and premises situate at Chalk aforesaid in the said lastly state indenture particularly mentioned were conveyed To the use of the said John Campion his executors administrators and assigns for the term of Ninety-nine years for securing to the said James Campion his executors administrators and assigns the due payment of an annuity of Fifty-eight pounds ten shillings during the lives of the persons therein named. 5,. The said testator afterwards made a codicil to his said will dated the Fourteenth day of March One thousand eight hundred and thirty-nine whereby he declared that he was desirous that the property bequeathed to his daughter Mary by his said will should be for the benefit of herself and her children and he therefore appointed his executors named in his will trustees to the said property. That they might see his intention fulfilled the said testator also made another codicil to his said will dated the Fourteenth day of March One thousand eight hundred and thirty-nine and thereby bequeathed to his son the sum of Fifty pounds. 6. The said testator departed this life in the month of March One thousand eight hundred and thirty-nine without having altered or revoked his said will and codicils And the said will and codicils were duly proved in the Prerogative Court of the Archbishop of Canterbury on the Ninth day of May One thousand eight hundred and thirty-nine by the said defendant John Goldsmith and Enoch Fowler since deceased the executors thereof. 7. The said Enoch Fowler departed this life on or about the Fourth day of June One thousand eight hundred and forty-four. 8. The said Alfred Goldsmith in the said bill named survived the testator but he had since departed this life and there is no legal personal representative of the said Alfred Goldsmith. and made and executed by and between Jane Harris Campion (executrix of the said James Campion then deceased) of the first part the said John Campion of the second part the said Maria Butler of the third part the said William Henry Cotterill of the fourth part and Frederick Shepard Hull of the fifth part. For the considerations therein mentioned the said annuity of Fifty-eight pounds ten shillings and all arrears thereof were assigned to the said William Henry Cotterill in trust for the said Maria Butler and the aforesaid term of Ninety-nine years was duly assigned to the said Frederick Shepard Hull for better securing the said annuity. 12. Default was made in payment of the said sum of One thousand six hundred pounds and interest on the day or time appointed for payment thereof in and by the proviso for redemption contained in the said last indenture. 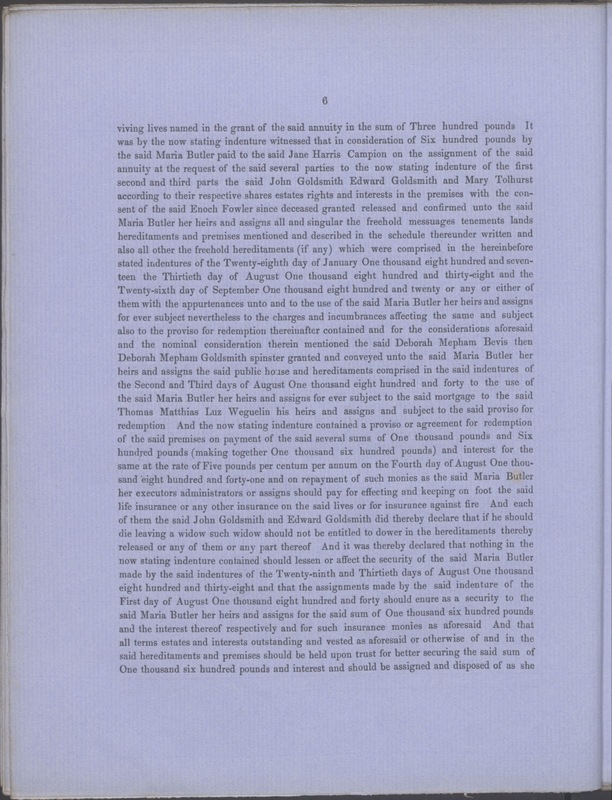 the said sum of One thousand six hundred pounds and the interest thereof according to the true intent and meaning of the now stating indenture and subject thereto In trust for the said John Goldsmith Edward Goldsmith and Mary Tolhurst their heirs executors administrators and assigns or other the persons or persons entitled to the equity of redemption in the said premises and to be assigned and disposed of from time to time as he or they should direct and upon no other trusts whatsoever. And all that the said annuity or yearly sum of Fifty-eight pounds ten shillings granted and secured to the said James Campion under and by virtue of the said herein before recited indentures of the Twenty-fifth and Twenty-sixth days of September One thousand eight hundred and twenty and all arrears and future payments thereof and all powers and remedies and covenants therein given and granted and entered into and are now vested in the plaintiff George Matthews Arnold his executors administrators and assigns for the natural lives of the persons during whose lives the same were granted as aforesaid. 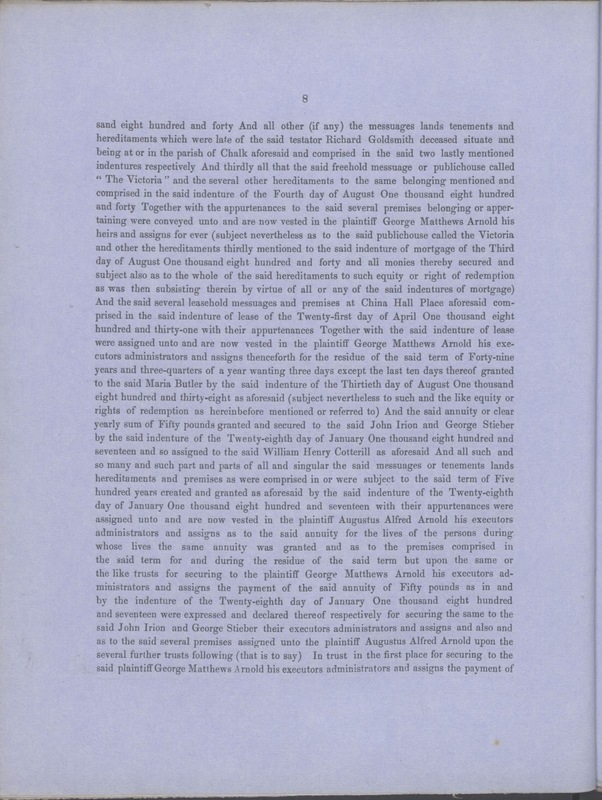 In trust nevertheless for the plaintiff George Matthews Arnold his administrators and assigns And all and every the messauges lands tenements hereditaments and premises by the said indentures of the Twenty-fifth and Twenty-sixth days of September One thousand eight hundred and twenty with their appurtenances were assigned unto and are now vested in the said plaintiff Augustus Alfred Arnold his executors administrators and assigns for the residue of the said term of Ninety-nine years But nevertheless upon or for the same or the like trusts intents and purposes for raising and securing to the said plaintiff Augustus Alfred Arnold his executors administrators or assigns In trusts for the said plaintiff George Matthews Arnold his executors administrators or assigns the due and regular payment of the said annuity or yearly rent charge of Fifty-eight pounds ten shillings as were for that purpose contained and declared by the said indentures of the Twenty-fifty and Twenty-sixth days of September One thousand eight hundred and twenty in favor of the said James Campion his executors and assigns and upon and for no other trusts intent or purpose whatsoever. 14. 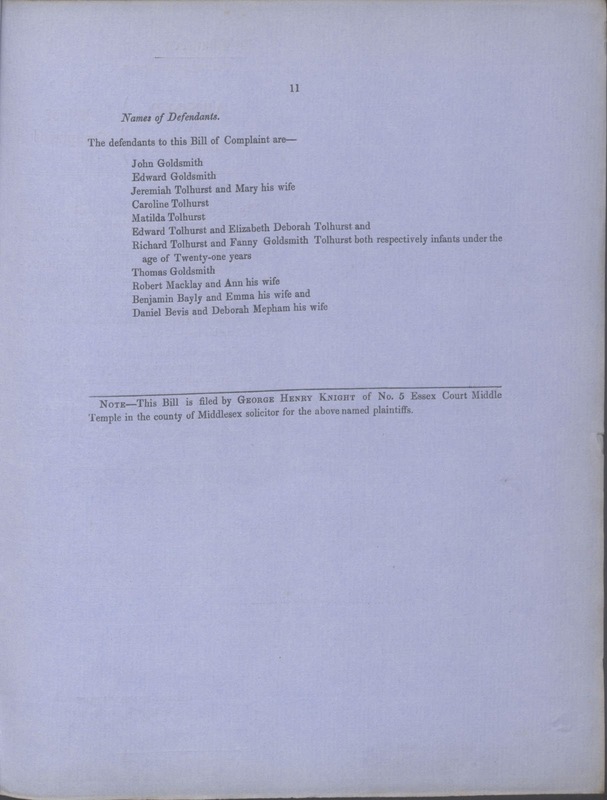 The said Mary Tolhurst has had (six struck through – superscript) fifteen children and no more seven of whom only survived the said Testator namely Mary Tolhurst and the said defendants Caroline Tolhurst Matilda Tolhurst Edward Tolhurst and Elizabeth Deborah Tolhurst and the said defendant Richard Tolhurst and Fanny Goldsmith Tolhurst who are both infants under the age of Tweny-one years and such six children respectively claim to be interested in the equity of redemption of the said mortgaged hereditaments. 15. 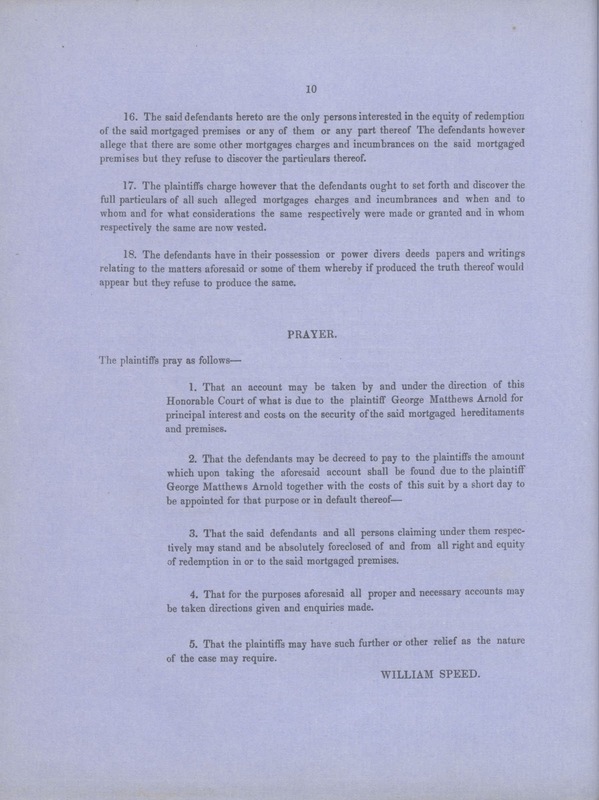 The whole of the said principal sum of One thousand six hundred pounds with an arrear of interest thereon still remains due and owing to the plaintiff George Matthews Arnold upon the securities aforesaid and the said mortgaged premises being but a scanty security for the same the plaintiff George Matthews Arnold has applied to and requested the defendants hereto to redeem the said mortgages or to release their equity of redemption in the said premises but they refuse to comply with such request. 16. The said defendants hereto are the only persons interested in the equity of redemption of the said mortgaged premises or any of them or any part thereof The defendants however allege that there are some other mortgages charges and incumbrances on the said mortgaged premises but they refuse to discover the particulars thereof. 17. The plaintiffs charge however that the defendants ought to set forth and discover the full particulars of such alleged mortgages charges and incumbrances and when and to whom and for what considerations the same respectively were made or granted and in whom respectively the same are now vested. 18. The defendants have in their possession or power divers deeds papers and writings to the matters aforesaid or some of them whereby if produced the truth thereof would appear but they refuse to produce the same. 1. That an account may be taken by and under the direction of this Honorable Court of what is due to the plaintiff George Matthews Arnold for principal interest and costs on the security of the said mortgaged hereditaments and premises. 3. That the said defendants and all persons claiming under them respectively may stand and be absolutely foreclosed of and from all right and equity of redemption in or to the said mortgaged premises. 4. That for the purposes aforesaid all proper and necessary accounts may be taken directions given and enquiries made. 5. That the plaintiffs may have such further or other relief as the nature of the case may require. 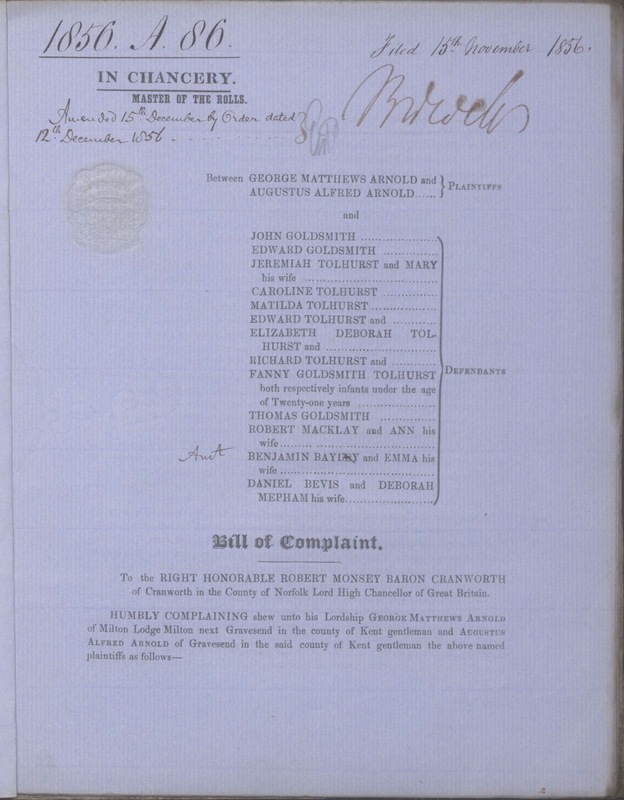 NOTE – This Bill is filed by GEORGE HENRY KNIGHT of No. 5 Essex Court Middle Temple in the county of Middlesex solicitor for the above named plaintiffs. To the within-named defendants John Goldsmith Edward Goldsmith Jeremiah Tolhurst and Mary his wife Caroline Tolhurst Matilda Tolhurst Edward Tolhurst and Fanny Goldsmith Tolhurst both respectively infants under the age of twnty-one years Thomas Goldsmith Robert Macklay and Ann his wife Benjamin Bayly and Emma his wife Daniel Bevis and Deborah Mepham his wife – Greeting. We command you and every of you that within Eight days after service hereof on you exclusive of the day of such service you cause an appearance to be entered for you in Our High Court of Chancery to the within Bill of Complaint of the within named George Matthews Arnold and Augusts Alfred Arnold and that you observe what our said Court shall direct. Witness Ourself at Westminster the Fifteenth day of November in the Twentieth year of our Reign. NOTE. – If you fail to comply with the above directions you will be arrested and imprisoned. Appearances are to be entered at the Record and Writ Clerk’s Office Chancery Lane. London. 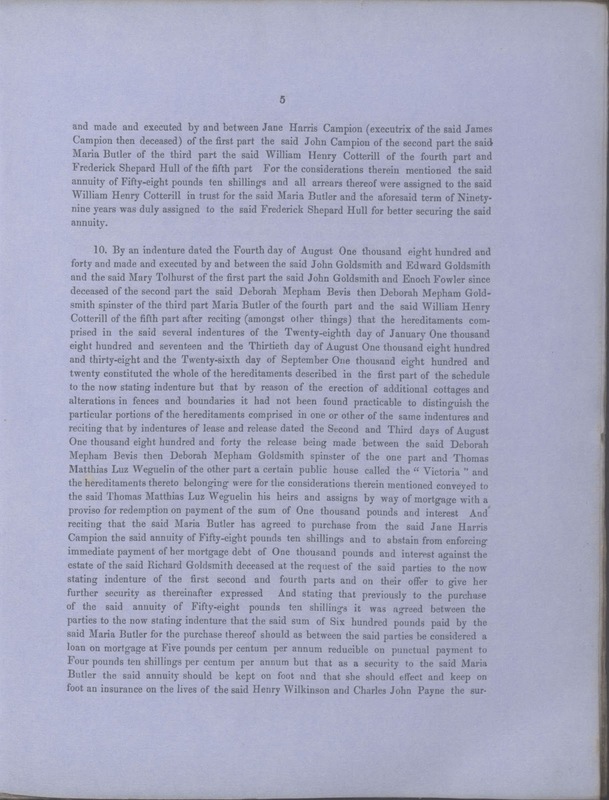 Plaintiff George Matthews Arnold filed this suit in Chancery against the heirs to the will and estate of Richard Goldsmith snr for the purpose of redeeming the mortgages, rents and other income derived principally from Richard Goldsmith’s properties, the China Hall and the Victoria Inn at Rotherhithe, and several other of his holdings at Chalk, Kent. He also wanted the Goldsmith heirs to produce evidence of other deeds held on properties but they refused (see pages 9-11). The Court ordered they should comply under penalty of arrest. 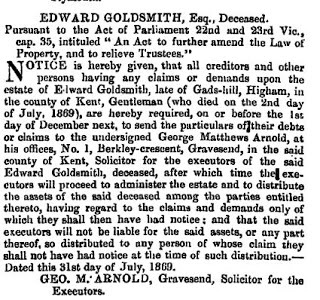 When Captain Edward Goldsmith’s own estate was put at auction in 1870 at the Bull hotel, Rochester, the auction took place under under the watchful eye of George Matthews Arnold who acted as solicitor to the executors. The Bull was Mr Jingle’s “good house” in Dickens’ Pickwick Papers and the hotel he named the Blue Boar in Great Expectations. Dated this 31st day of July, 1869. The Victoria Inn is not known today, nor is Paradise Row. Old maps show its location behind Paradise Street, two streets back from the Thames walk known to Samuel Pepys as Rediff. Richard Goldsmith’s Princess Victoria Inn, outbuildings and cottages may have occupied the site where the Pynfold Estate now stands. A landmark of the area, William Gaitskell House (1814) now stands at the corner of Paradise Street and Cathay Road, but its location in 1839 was more likely to have been at the corner of Paradise Street and Lucas Lane, which no longer exists, and opposite the site occupied by Princess Victoria Inn. William Gaitskell’s house was possibly connected to Richard Goldsmith’s property by a tunnel which is now blocked off. The tunnel was through the skittleground beneath the courtyard of the Victoria Inn, specifically mentioned in his bequest to daughter Deborah. 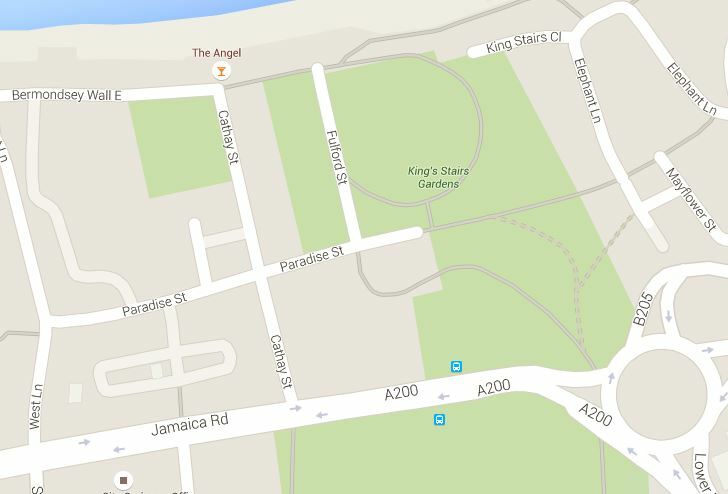 William Gaitskell House (red arrow and red door), is now located at the corner of Paradise Street and Cathay Road. 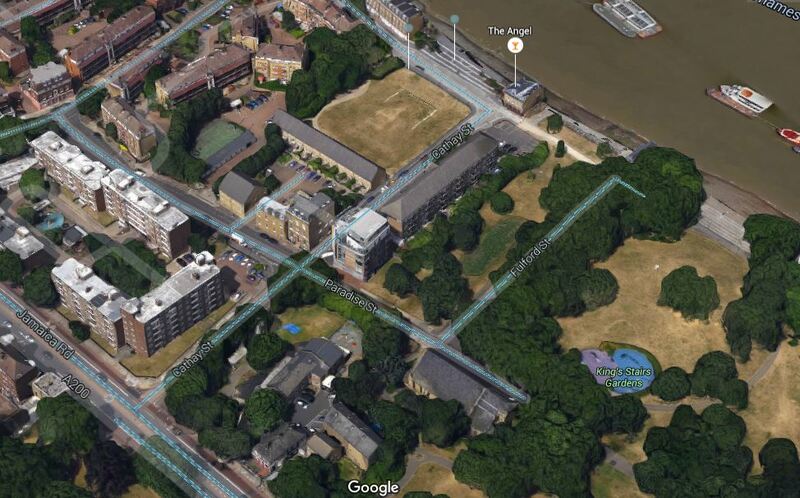 But on the survey map of 1832 (British Library’s software then-and-now locator) it was located at the juncture of Millpond Road and Paradise Street where Love Lane continued alongside Richard Goldsmith’s property to Paradise Row. The buildings along Love Lane and fronting Paradise Row, clearly visible in 1832, were most likely the Victoria Inn, the cottages, outbuildings and land now occupied by a housing complex, the Pynfold Estate. The significance of William Gaitskell’s house at 23 Paradise Street is not just proximity to the Victoria Inn. 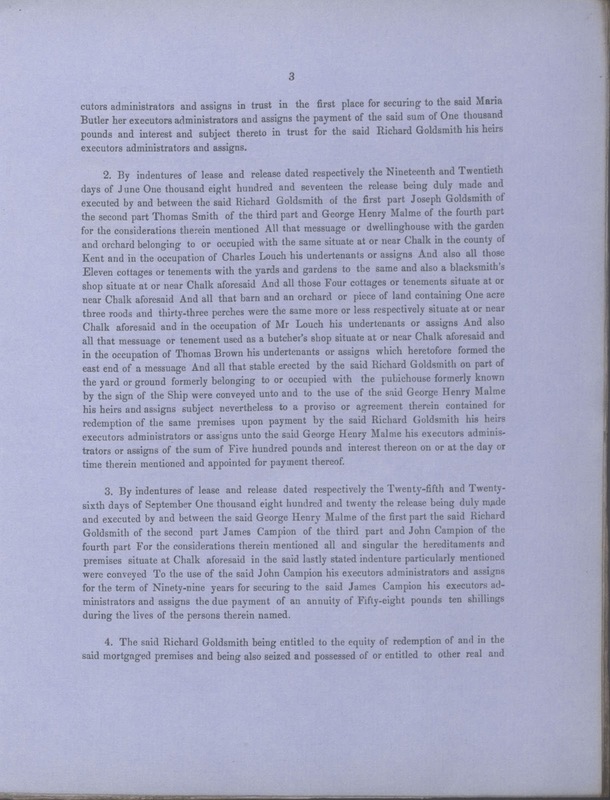 Gaitskell’s partner, Charles Ventris Field signed Richard Goldsmith’s will and codicils in August 1836 and March 1839 as a witness along with Edward Goldsmith, and he also he paraphrased the will’s contents as further endorsement [click here – NB this script is barely legible in places]. Sir William Gaitskell married Mary Sophia Poussett in 1785, and seems to have had two children, William Gaitskell the younger, Harriet Eliza Gaitskell and Edward Howe. There is no mention of why Edward had a different surname from his siblings. Mary Sophia died in February 1828 at the age of 68. Sir William died in June 1833 at the age of 70. Sir William, his son William and Charles Ventris Field were apparently in a partnership as surgeons and apothecaries. The London Gazette has a notice that the partnership between the three men was dissolved in May 1831, and that the partnership between Gaitskell and his son was dissolved in February 1832. In the same month, his estate was conveyed by indenture to Thomas Gaitskell. Somewhat ironically, given Gaitskell’s alleged body snatching activities, 23 Paradise Street became a police station in 1836 and was the base of M Division. The Watch House on St Mary Church Street, which had been established in 1821, was in operation until 1829 when the Metropolitan police force was established, and it is unclear where the watchmen who operated in the area between 1829 and 1836 were based. In 1850 an extension to the west was added in order to house cells. By 1864 there were 117 officers working from there. A 1917 photograph shows it with bars over the ground floor windows, and only three windows on the eastern wall, where now there are seven. During the Second World Ware an air raid shelter was placed on the roof. The police moved in 1965 to new, typically 1960s premises on Lower Road. Although it stood empty for some years afterwards it was restored and is now used as offices. Source: Andie Byrnes. Rotherhithe resident, living next to Greenland Dock. More historic that even antiquaries are aware, what remains to us of China Hall was the tavern approach to a riparian playhouse visited by Pepys and mentioned in his Diary. Down to the Regency, at least, persons of quality often preferred the entertainments of the East End to those nearer home, on account of a pleasant trip beyond the Tower with a jolly young waterman plying the oars. The gossiping diarist is not specially informative as to the playhouse or its frequenters towards the eastern limits of London in his day, therefore we are left to assume that it must have been a summer theatre, and, judging from its title, porcelain or chinaware embellishments gave it a distinctive character…..
On Lower Road, about half way between Surrey Quays and Canada Water stations, is a public house called the China Hall; at one time it was the entrance to a riparian playhouse visited by Samuel Pepys and mentioned in his diary. It is not known how long the theatre remained on the site, but it was reinvigorated in 1777 and during 1778 George Frederick Cooke acted there, but in the winter of 1779 it was destroyed in fire. 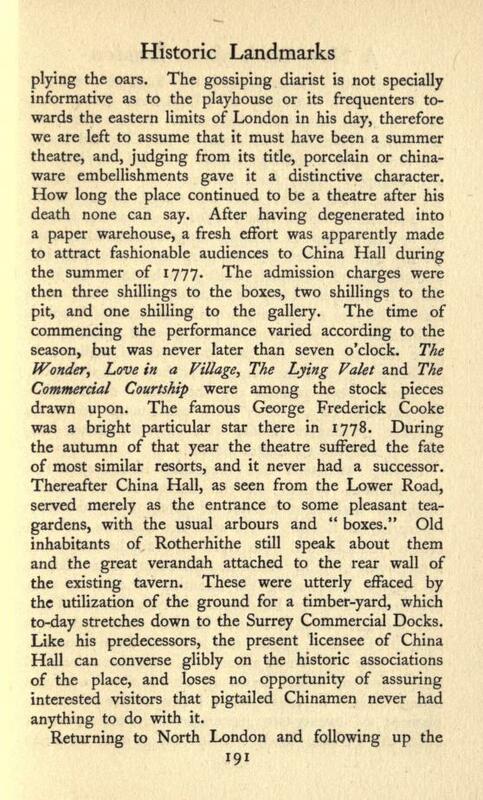 The site of the theatre became a well-known tea-gardens, with the “usual arbours and ‘boxes'” during the Victorian period, but by the 1920s most of the gardens had been absorbed into the Surrey Commercial Docks as part of a timber yard. A Rotherhithe family is asking the public to help raise £10,000 in the bid to keep their pub open. China Hall landlords Michael and Linda Norris are asking residents to help them in their “hour of need” as they fight to keep their business and home. Trouble began for the couple when the freehold of the pub building, in Lower Road, was sold to Isle of Man-based developer Hamna Wakaf by previous owners Punch Tavern. The developer also owns The Winnicott pub, formerly known as The Old Justice, in nearby Bermondsey Wall East, and put forward plans to turn it into flats, which were rejected earlier this year. The new owners offered Mr and Mrs Norris a ten-year lease for £75,000 a year – which the couple said was double what they previously paid and unaffordable. 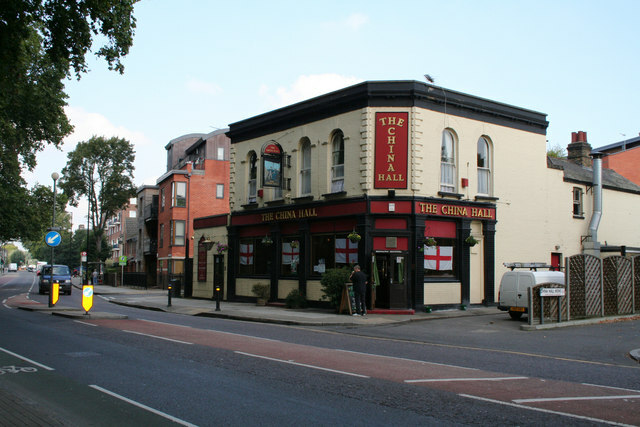 With the help of the southeast London branch of the Campaign for Real Ale, they managed to get the pub listed as an asset of community value in February, which means they must be given the chance to bid to buy the freehold of the building if it comes up for sale. As an extra layer of protection, Southwark Council has also introduced an Article 4 direction in its planning policy which requires developers to gain permission before changing a pub into any other type of business or residential accommodation. Speaking to the News, China Hall landlord Michael Norris said he felt “hopeful” about the pub’s future. “I want to say thank you to those who have donated and to the people who have supported the campaign to keep us open,” he added. Former Bermondsey and Old Southwark MP Sir Simon Hughes, who has helped with the campaign, said: “Now is the time for people to put their money where their mouth is. 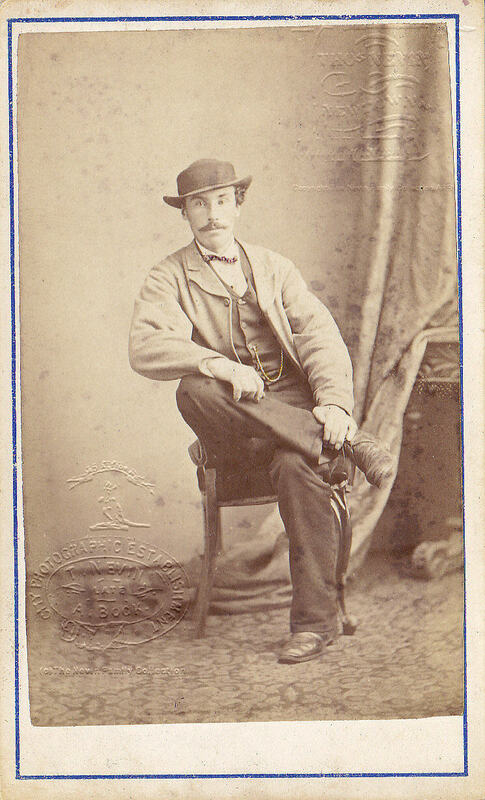 Arnold, George Matthews (1826-1908) of Milton Hall. Eldest son of Robert Coles Arnold (1797-1866) and his wife Sarah, daughter of Daniel Pizzey of The Beeches, Rayleigh (Essex), born 4 July 1826. Solicitor, 1847-89; an auditor for the Poor Law Board for more than 30 years and legal adviser to successive RC Bishops of Southwark. 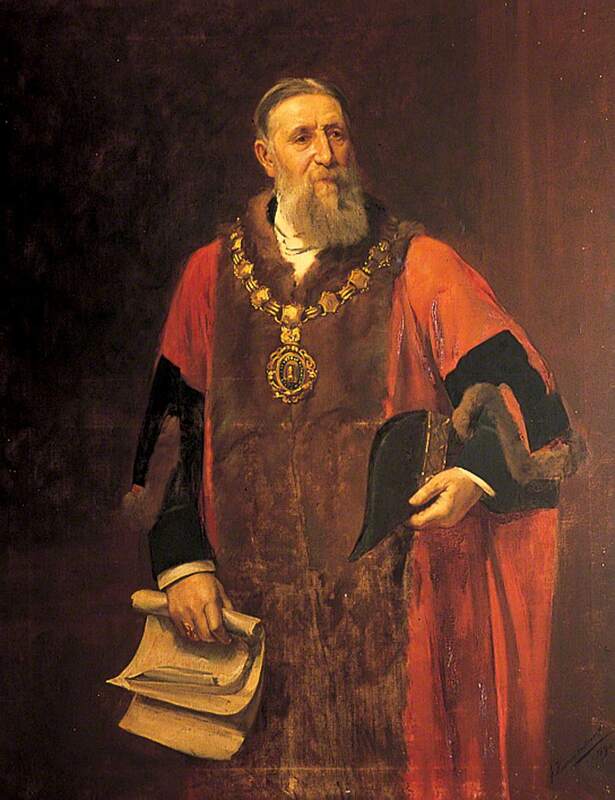 JP, DL and County Alderman (1889-1908) for Kent; Mayor of Gravesend (Kent), 1890-92, 1896-97, 1904-06 and a benefactor to the town; Chairman of Kent CC Education Committee, 1903-05; Fellow of the Society of Antiquaries of London and a keen local historian; he amassed a museum of local antiquities which occupied a series of buildings on the estate and which was dispersed by auction in 1911; and he also rebuilt the derelict church at Denton and the chapels at St. Catherine, Shorne and Dode. He was born into the Church of England but converted to Rome with his wife in 1859; Knight of St Gregory the Great. He married, 31 May 1847 at St Botolph Aldgate, London, Elizabeth Cotton (1828-1906), daughter of George Essell JP of Rochester, and had issue with two other children who presumably died in infancy as no record of them has been found.